The 10th session of the “Small sewing – big projects” charity sale organized by Bik-Nok will start in just a month: March 24! The theme is “Liberty, prints and flowers”. You still have a little bit of time left if you want to donate a handmade item for the sale. Or just head over there on March 24 to pick an item to buy. ^_^ The website is in French only, but some people send anywhere in the world. Just look for the “Envoi : en France et à l’Étranger” mention below the price in the item description. The benefits will be used to help give shelter and education to poor children in Vietnam (if you read French, you can find more info here). I got the idea for this skirt in September, I thought it would be nice to make it a two-color skirt in autumn shades, with a fabric and length that would work for rainy days when I like to wear my boots. 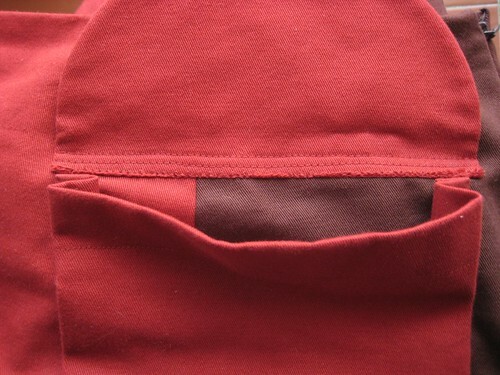 Since the orange I could find was too flashy, I chose dark red and brown cotton serge. first “real” invisible zipper with an invisible zipper foot. It’s still not perfect but it’s better than before (when I used a regular zipper foot). first use of a serger during the sewing lessons (we have two! 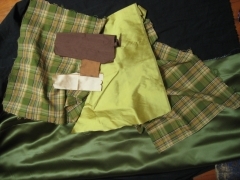 ), to finish the bottom of the facing and the bottom of the skirt (the teacher feared it would be too bulky with a real hem so the end was just serged and folded once). according to their size chart I started with a size 36 at the waist and went to a size 40 at the hips. Since I wanted it as A-line shaped as possible I liked having a larger size at the bottom. It turns out their size 36 is quite large, because after I basted the skirt and tried it on we removed a few more centimeters at each seam between the waist and the hips (that’s when it’s useful to be with a teacher who can mark the changes while you’re wearing the skirt). 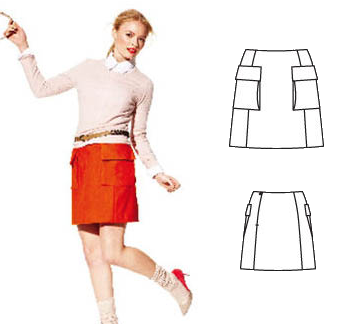 That said, the picture and description were not clear as to where the skirt is supposed to sit: natural or low waist? We went with my natural waist. I did a machine invisible hem, changing my thread color as the fabric changed. At first I was supposed to add a lining but I ended up not adding it so that the skirt would be finished one week earlier. The teacher suggested I make a half or full slip to go under, which I think is a great idea because I’ll be able to use it with other pieces. 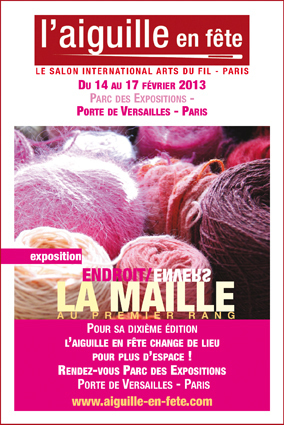 L’Aiguille en fete is a french convention centered around needlework. The 2013 edition will start tomorrow February, 14 and last until Sunday. I’ve been there in 2010 and 2011 and really enjoyed it. I missed it last year because I was preparing the wedding and really didn’t have any spare time to go, but I intend to go this time! I even bought my ticket in advance. As you can guess it consists mainly in seller booths. Lots of quilting and embroidery (mainly cross stitch), but also a good number of knitting/crochet and some general sewing (notions, fabric, kits, patterns…). This time they changed their location to a bigger venue, so I guess there will be more sellers and maybe a little more variety. Still, even if I don’t quilt (yet) or knit, and if cross stitch isn’t my favourite kind of embroidery, I found the event to be quite inspiring. Plus it’s nice to be surrounded by lots of people who also like needlework (in 2011 I didn’t have that many people around me to share that love with). Each year they pick a theme and organize some exhibitions centered around it. The years I went the themes were “theater costumes” and then “lace”, and I found the exhibition quite interesting. I think it’s nice they not only have seller booths but also an exhibition part. The theme is year is “knits”. If you’re in the neighborhood, you might want to take a look! I wish you a wonderful year! My grand mother would say (and would be right in saying so) that I’m a bit late, but I’d rather be late than miss this opportunity to wish for happiness. I hope 2012 ended well, that 2013 is starting nicely and wish you a lot of good things for the rest of the (still new) year. first, this blog became self-hosted with a better handling of the different languages, which is nice. I organized my first giveaway, by taking part in Sew Mama Sew!’s Giveaway Day. ^^ It was fun, I’d like to do more in the future. I made my first real pdf tutorial, with detailed step by step pictures and everything, to make an adjustable fabric book cover. I went for the first time to the Saint Ouen flea market and had a lot of fun browsing through the vintage stuff. Big project n°1: I got married !!!! That was the reason I disappeared at the end of 2011 and for the beginning of 2012. It was a wonderful and magical moment. I hope to tell more later about the things we made ourselves for the occasion. 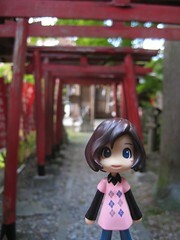 We went back to Japan for a 3 weeks honeymoon at the end of the year. This isn’t closely related to the subject of this blog, except for the sewing-related treasures I brought back with me. I might share some pictures of that. I left with the intention to enjoy their fabric shops, and believe me I did! After being away for three years I had a good idea of what I can’t find here and what I miss. I came back with lots of fabric, some lace (mainly doll sized), a few tools and a few books (not too much because books are heavy and they can be found pretty easily on the Internet). 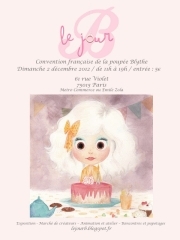 Big project n°2: I got a dealer booth at Le Jour B 2012! It is a one day event centered around the Blythe doll, with lots of makers selling their clothes/accessories/custom dolls/etc. So for the first time since I took part in the Dollshow in 2009, I got a booth where I sold my little dolly clothes! I will probably share a few more info later (and pics !). 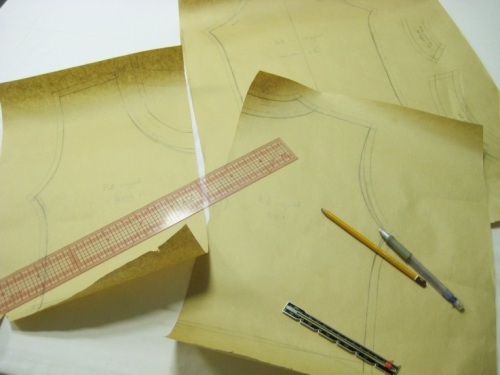 Lastly, I started to take sewing lessons. It was something I wanted to do when I came back to France in 2009. I missed my chances several time, but this year I finally decided to do it for real and subscribed at the right moment. I was hesitant because I’m not a real beginner and I was afraid I wouldn’t learn much. But I thought it would at least force me to sew for 3 hours every week. I’m much slower that I hopped, but our teacher is a professional costume-maker and it’s really interesting to be able to ask her questions. Plus it’s nice to share some time with other sewing-enthusiasts. The lessons are organized by Paris Ateliers, hence the logo above. I designed (that started in 2011) my wedding outfit and made half of it (skirt + top + corset embroidery). The other half (corset + over-skirt) was made by a professional corset maker. This was one of the biggest sewing projects of the year, I spent many hours on it. 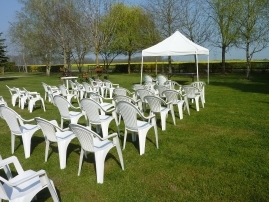 But it was really worth it, the result was quite nice, my husband and I loved it and I got many compliments. I really intend to share more info about this project. In the meantime you get a little fabric teaser in the picture above. a pleated skirt from the 50′s with a matching belt. I have to share it also. three book covers (all of which were gifts) made after my tutorial, with different embellishments. a dolly dress I made as a gift for a friend. for the second half of the year I mainly worked on doll clothes for Blythe to prepare for Le Jour B. Many trials and samples (some of which I still need to work on), some outfits I’m pleased with. I had never worked much for that type of doll so there was a lot to do.